Backyard party ideas: Host the best summer party on your block. The grill doesn’t stop with burgers, so get your hot dog game on point with these killer hot dog recipe ideas (we’re big fans of having a fully-stocked hot dog bar) and an ingenious way to grill perfectly caramelized chicken. You can even grill vegetarian pizza. Also over at Cool Mom Eats, you can get tips for cooking juicy steaks — including one of our favorite recipes by What’s Gaby Cooking, above: skirt steak with tomato salad. Seriously, you don’t want miss this one. The ice cream sundae bar (above) by The Inspired Room has all the ingredients for an interactive outdoor dessert that kids and grownups will totally love. 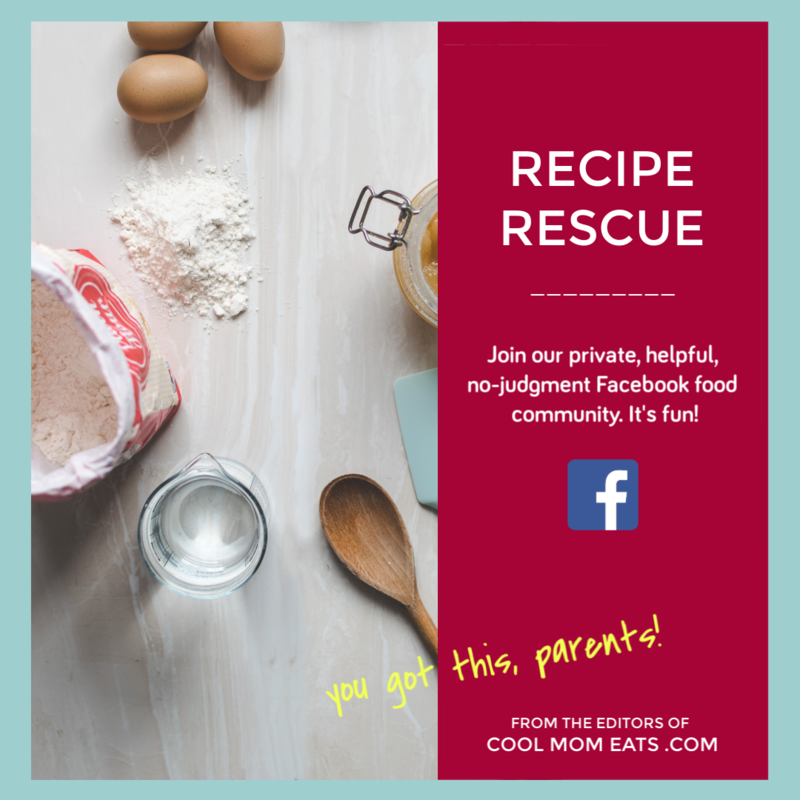 Click over for all her cool pro tips; though, we might swap out the mason jars for pre-scooped ice cream balls, which cuts down on time and mess. Another inventive backyard party idea: You can cut watermelons into popsicles or grill fresh bananas, peaches, and pineapple and drizzle them with sweet and easy-to-make sauces for something that’s a bit lighter, but still so good. 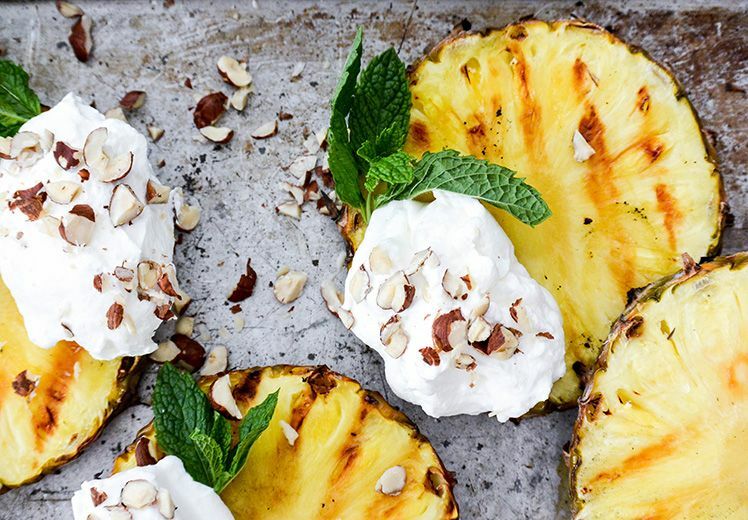 Doesn’t Floating Kitchen’s pineapple with coconut whipped cream (above) look perfectly divine? 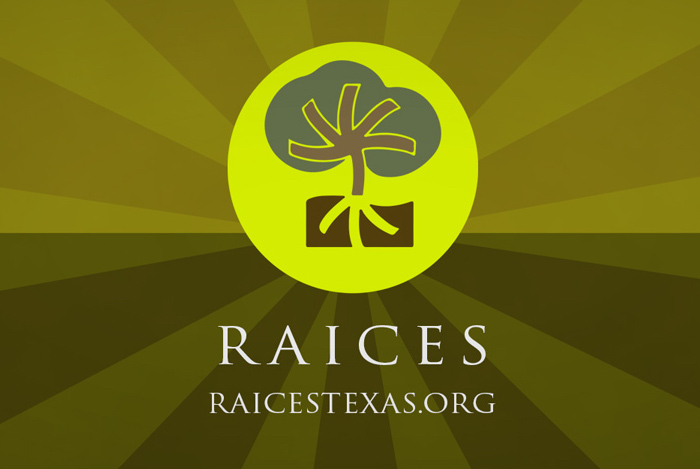 Check out the website for how-to details. Related: More than 50 recipe ideas and party tricks for the best summer soirees. We did mention how much we appreciate the caszh nature of backyard parties, right? Pretty sure we did, but hey — any excuse to use the word “caszh” again! The easy-going feel makes decor fun instead of a chore. Hostess with the Mostess made the cute (and free!) 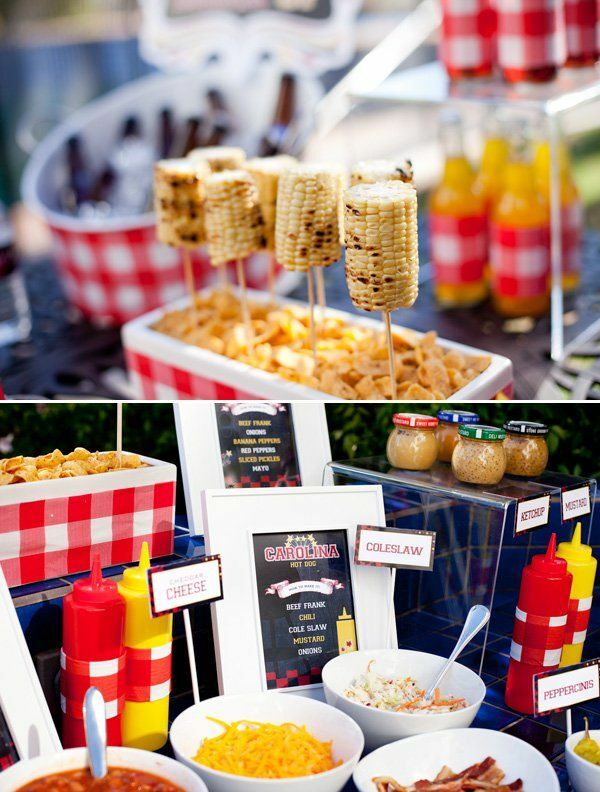 BBQ party printables (above), which include water labels too, and we’re totally smitten with the way those corn-on-the-cob skewers are presented in a tub of corn chips. Genius! Fabric tablecloths can be a nuisance if the wind kicks up, which is one of the reasons why we love The Postman’s Knock’s idea of using brown butcher paper tablecloths instead. Check out her site to see how it all came together. 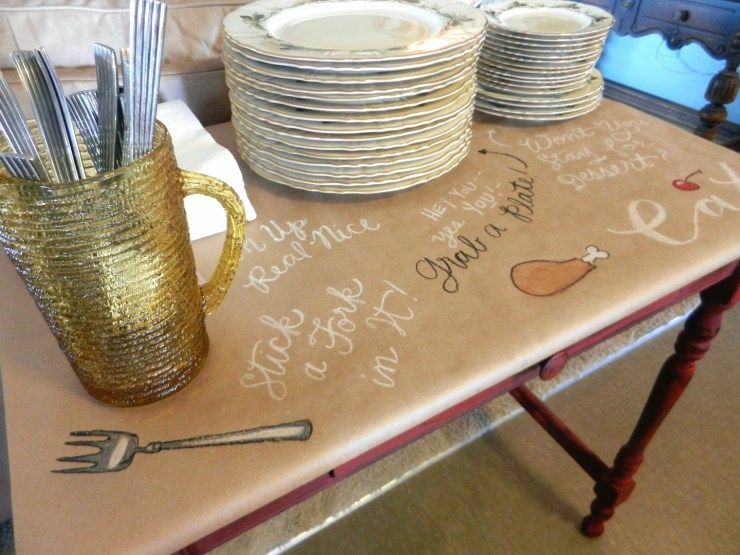 Essentially, you can label things at the serving table as Lindsey has (above), and if you put out canisters of crayons at each papered table, kids would totally have a blast covering the tablecloths with their own doodles and artwork. 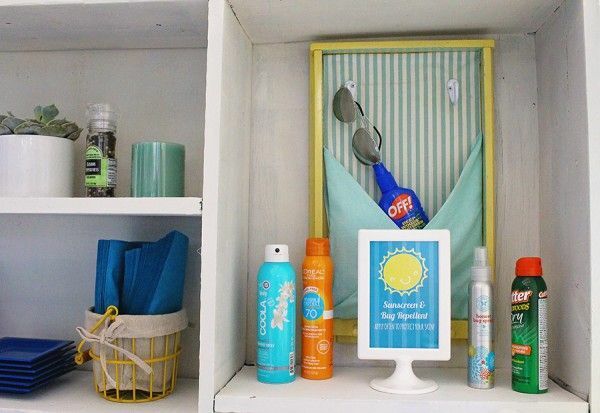 Today’s Creative Life set up a sunscreen and bug spray station with everything guests may need to discourage sunburns and bug bites. So smart! 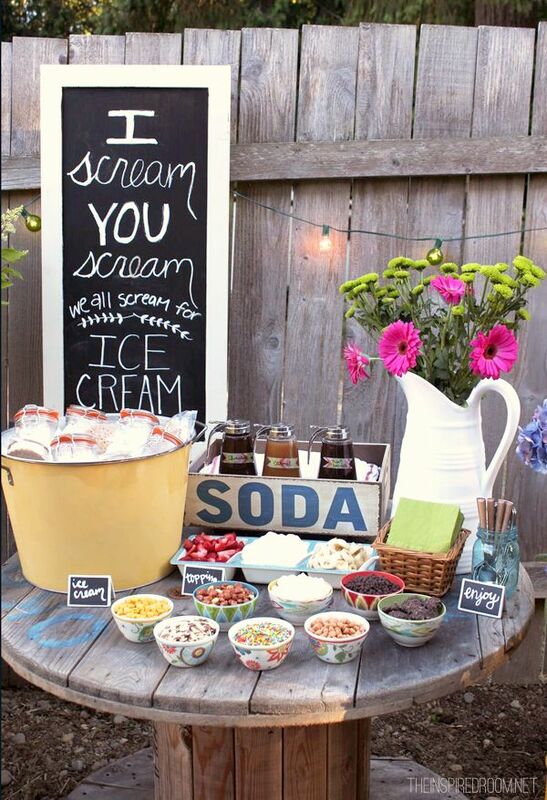 I imagine this backyard party idea would be a welcome relief for anyone who forgot their own supply, and it looks cute too. 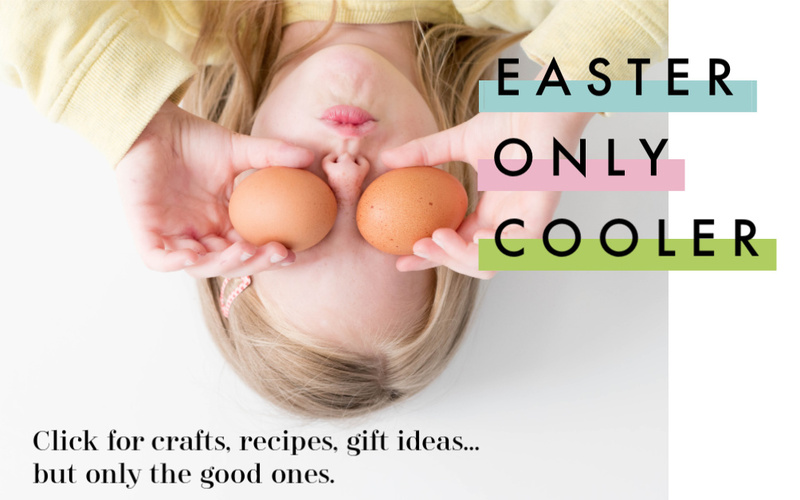 Click over to the site where you can get all her tips and also download the fun free printable to help you get started on making your own station. If the party is going to hit the evening hours, glow sticks are a must. Instead of waiting for nightfall to break them out, you can pop them into an easy DIY glowing centerpiece, like this one by The Cards We Drew. Then just pluck them out to play with them once the time is right. Click over for the easy tutorial and to see how cool it looks at nightfall. 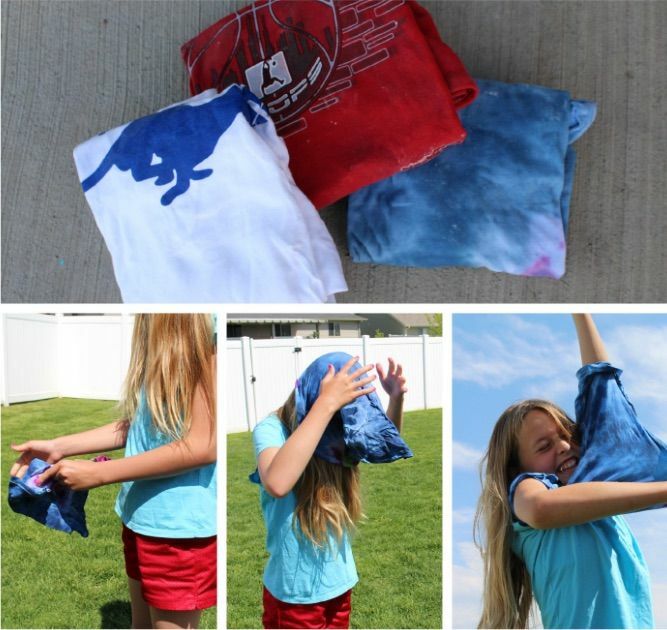 Related: Olympics-inspired backyard party games for your little athletes. 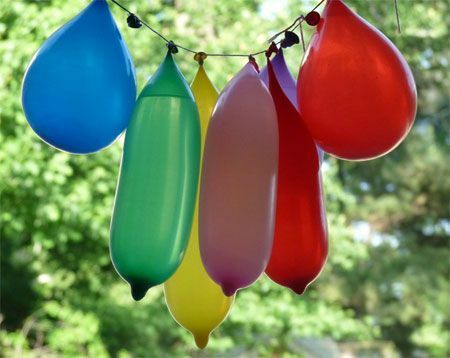 Being outside gives you the advantage of adding kids’ activities that are messier, louder, wilder, and — like the DIY water balloon piñata by Ziggity Zoom above — wetter. Click over for the how-to on this one — and how to DIY a pinata stick too. Or, you can get super creative with things you already have in your backyard, like baby pools and swings to make fun backyard obstacle courses for kids to master. We also love creative, artsy ideas like a rainbow yarn trail activity, which is easy to set up and silly enough to keep even the littlest kids’ busy. Right now, we’re a little obsessed with DIY water blobs and I love how Hello, Wonderful came up with the idea to make miniature water blobs (also shown at top) that the kids could even take home with them after the party is over. Click over for her step-by-step instructions and pro tips. We are, because we so need these in our lives right now. 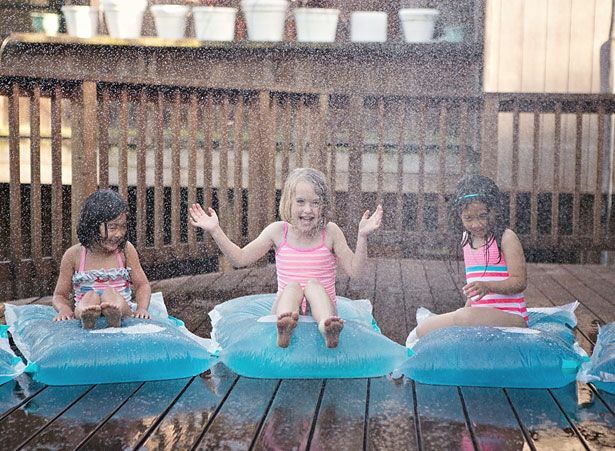 A Girl and a Glue Gun’s creative backyard party activity ideas are all guaranteed hits — seriously, how do you pick between a water-passing game and a grassy game of yard Twister? The answer, of course, is that you don’t! Which is why you should click over to her site ASAP, where you’ll also find instructions on pulling off a fantastically funny frozen T-shirt race (above). Hilarious! We’ve collected a bunch of outdoor party activities for kids in our post about how to throw a fantastic block party, which includes things like having a bike parade, water balloon races, and DIY cardboard cars, so be sure to check out the roundup for some really fantastic ideas. 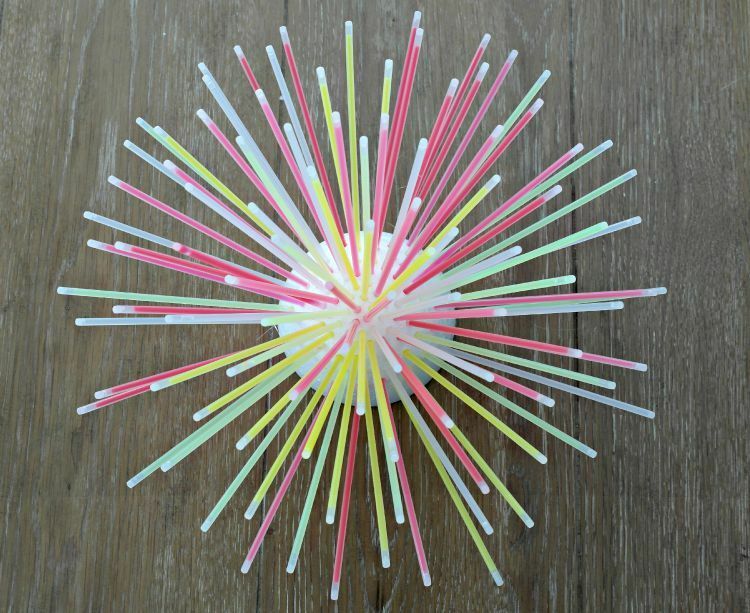 But the giant bubble wand by One Charming Party has proved to be a party favorite (for both kids and grownups) and so we couldn’t resist including it here too. The hardest part is getting the bubble solution to be just right, but she has great how-to tips! 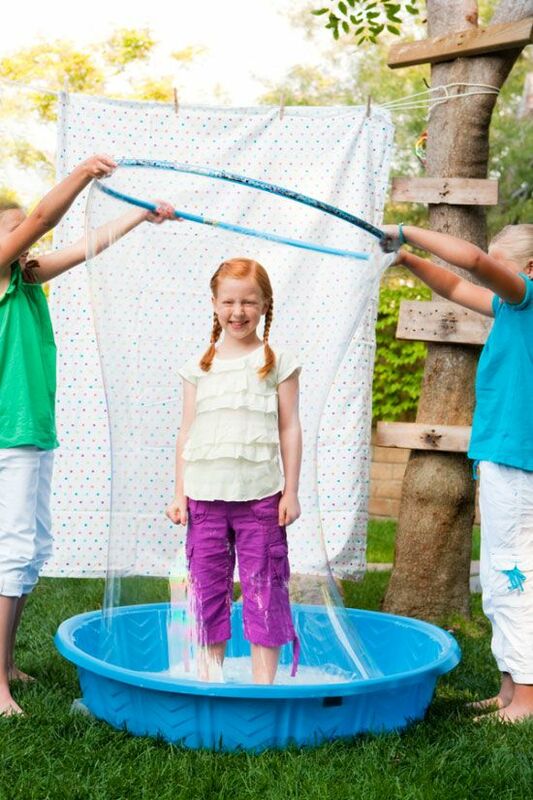 There are endless backyard party ideas for keeping kids busy and having fun together. 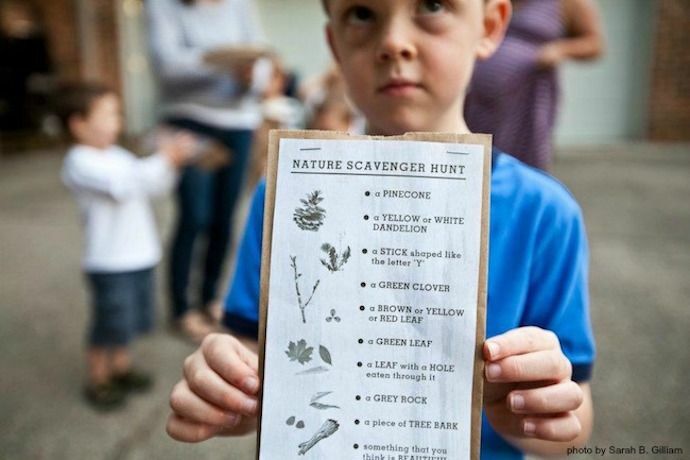 And everyone loves a good treasure hint or scavenger game, especially if there are worthwhile prizes at the end. This is something you could totally DIY, too, which is why we included the idea in our birthdays on a budget post. 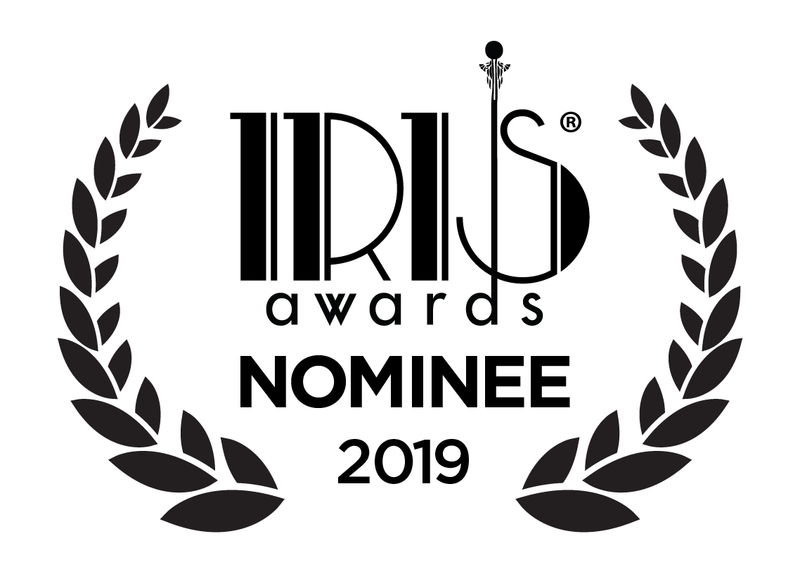 And, of course, relay races add a little bit of competition but when they’re as silly as the tag-team beach ball race party, there’s enough fun and laughter to zero out any possibilities of Sore Loser Syndrome. Also on the silly backyard party game list: popcorn shoe relay races, Vaseline nose races, and cheese puff head (trust us — just click that one). Inspiration overload. Totally want to have a backyard party now. So much fun!